We are proud to say that we are one among the most coveted manufacturer and exporter of Cotter Pins. 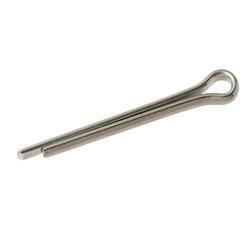 These pins are usually used as metal fasteners that are used while joining two metals together. We manufacture cotter pins according to the specifications of the client. Usually the cotter pin sizes are in nominal fractional inches, starting at 1/32. All sizes below 5/16 inch are intended to fit a hole 1/64 inch larger than the pin size. However, if the pins are larger than this, the pin and hole size are the same. We manufacture and supply Stainless Steel Cotter Pins that are mostly used for various industrial purposes.